Anyone with a color printer knows that selling replacement ink cartridges is the quickest way to become a millionaire. But what if your printer never needed a single drop of ink to produce color images at impossibly high resolutions? 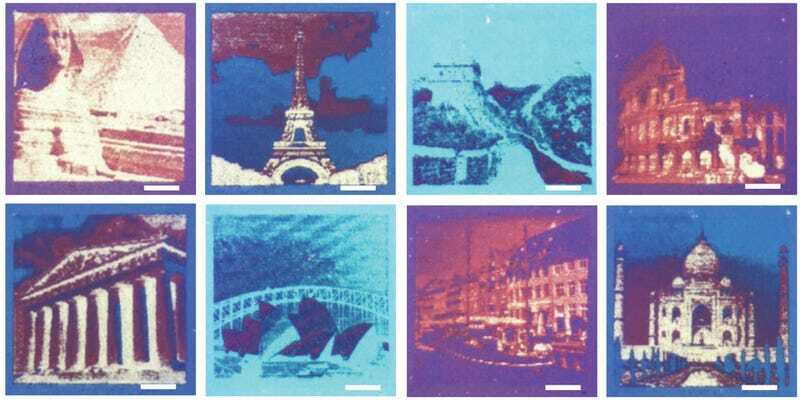 A new laser printer can already do that by etching microscopic patterns onto sheets of plastic. Researchers at the Technical University of Denmark have taken inspiration from creatures like butterflies and peacocks, whose wings and feathers create bright, iridescent colors not through light-absorbing pigments, but by bending and scattering light at the molecular level, creating what’s known as structural color. The new printing method the team has developed starts with sheets of plastic covered in thousands of microscopic pillars spaced roughly 200 nanometers apart. To get those tiny plastic pillars to produce color, or at least appear to, they’re first covered with a thin layer of germanium—a shiny, grayish-white metalloid material. An ultra-fine laser blasts the germanium until it melts onto each pillar, strategically changing their shape and thickness. This is then followed by a protective coating that helps preserves the shape and structure of all those tiny pillars. When light hits this modified plastic surface, the lightwaves bounce around amongst the various pillars, which end up changing their wavelength as they’re reflected, producing different colors. The researchers were able to predict what colors would be produced by those nanoscale pillars, and by creating specific patterns, they were able to generate recognizable, high-contrast images. How high contrast? Your average desktop inkjet can produce images with a resolution of around 5,000 dots per inch. Laser printers, which use a fine powder called toner, can muster a resolution closer to 20,000 dots per inch. 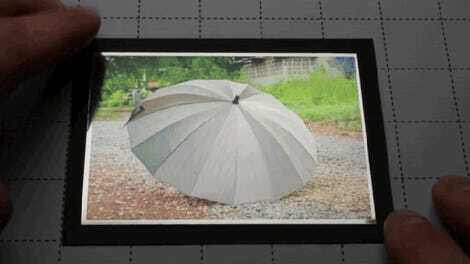 But this new technology can generate detailed images with an astonishing resolution of 127,000 dots crammed into a single square inch, making it ideal for anti-counterfeiting, since a high-res watermark could be created that’s smaller than a pin head. Will this technology replace your home inkjet printer that’s always begging for a refill? Not anytime soon, but eventually it could replace paper printing altogether, since those plastic sheets could be easily recycled by the very same laser that prints on them. Eventually, the days of having to constantly reload your printer’s paper tray might end.